Why choose Canyonlands Field Institute for your next adventure? CFI strives to create unforgettable experiences. Our unique land and river trips incorporate activities that bring families, friends, and student groups together, create shared memories, and strengthen appreciation for the place we call home. CFI focuses on participation and learning. 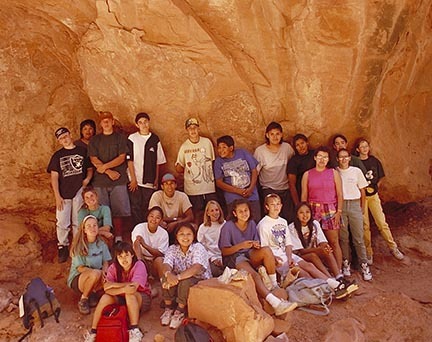 With our knowledgeable expert Guest Guides and CFI Naturalist Guides, everyone has a role as we explore the desert environment, cultural history, and daily living through active, fun, and unique learning experiences. We are committed to taking a sensible approach to trip planning and provide affordable lodging, delicious and healthy meals, and comfort without the pampering. We believe and engage in buying locally from the many resources we have close to home, teaching “leave no trace” principles, and other environmentally sound practices on every trip. CFI is a nonprofit organization. While we provide rich experiences for you, your trip dollars help underwrite outdoor education programs for schools and youth.